The Walls House, a two-storey vernacular Classic Revival farmhouse, built circa the turn of the 20th century, is located on the east side of Main Street in the northern end of the Village of Blackville. It is situated within unusually close proximity to the road. The designation also includes the grounds and the “outside kitchen” building. The Walls House is designated a Local Historic Place for its association with Charles Walls, a farmer and mill worker who was a descendant of a longstanding name in the Village of Blackville. Charles raised his family here. The residence and family possessions of the home were conveyed to the Blackville Parish Library and Historical Society Inc. in 1986. The Walls House is a good example of Classic Revival vernacular residential architecture from the turn of the 20th century. The residence remains integral to its original construction, situated at road’s edge and is a reminder of days of horse and wagon roads. It is surrounded by a fallow field. 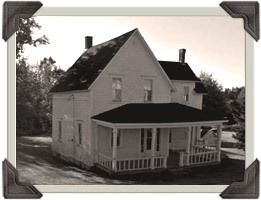 Until early 2000, the homestead functioned seasonally as a community library and museum. Its interior offers a fine example of typical family-life in rural New Brunswick. The “outside kitchen” or “back kitchen”, repositioned from its original site, was seasonally used during warm summer days to prepare the home’s food and harvest while avoiding uncomfortable conditions and thus denotes a bygone era.